A visit to Rajasthan is surely a rewarding experience. To add more into its rewarding nature - our presents Rajasthan Haveli Homestay Tour. This is an attempt to present the architectural surprises of Rajasthan to the tourists. 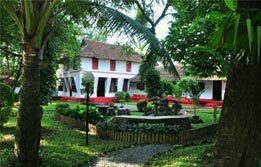 The state has pioneered the concept of turning the heritage merchant mansions and forts into affordable heritage accommodation. 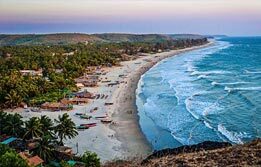 Many city and towns here host the tourists during their enchanting tour to this royal state of India. 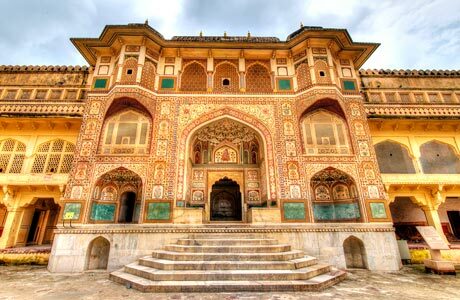 This haveli homestay tour provides a lucrative and hospitable accommodation in the heritage masterpieces of Rajasthan. 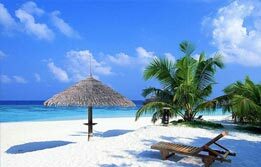 The simplicity and traditional fervour of home also offers an edge above other tours. Upon arrival in Delhi - meet our representative who will assist the transfer from airport to the Colonel's Retreat / Dolphin Just Like Home / Shanti Home. Homestay accommodation in Delhi will be the first experience of gracious Indian hospitality here. 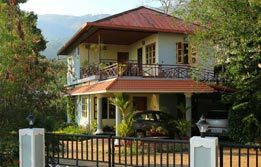 These homestays provide clean and comfortable accommodation befitted with modern conveniences to suit a traveller's need. Discover the capital of India - Delhi with the soothing comforts of a home. Overnight in Delhi. After breakfast in the homestay - dedicate the whole day of sightseeing in Delhi. This is a city of unique character where old and new intersperses together to form a bustling cosmopolitan city. Begin the Delhi city tour in a traditional way via visiting Old Delhi. This part of city is a continuing legacy of the ancient and medieval era. 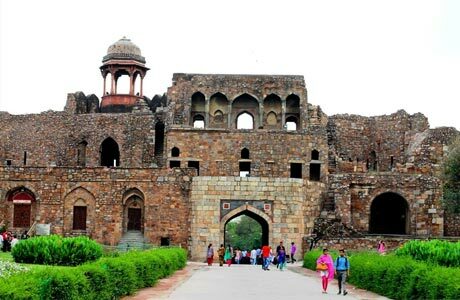 Visit Purana Qila or Old Fort - the Pandava legacy in Delhi - Humayun Tomb - dedicated to the second Mughal emperor. Continue Delhi tour via a visit to Red Fort - the massive red sandstone fort constructed by fourth Mughal emperor Shah Jahan. Overlooking the stately monument is the heritage market of Chandni Chowk and the largest Asian mosque - Jama Masjid again constructed by Shah Jahan only. Pay respects to Mahatma Gandhi at Raj Ghat - his cremation site. Later in the evening - visit Qutub Minar - the largest Asian minaret built in the beginning of the medieval era. This surreal experience is taken ahead with a drive to the 100 year old legacy of modern Delhi - designed by Sir Edward Lutyens. This includes a visit to the national monument of the India Gate - which is an arched gateway dedicated to the Indian soldiers who lost their lives during the Third Anglo-Afghan war. A drive past scepter of Indian democracy - Rashtrapati Bhawan or President House and Sansad Bhawan or Parliament House of India sums up the delightful day in Delhi. Return back to the homestay for overnight in Delhi. After breakfast in Delhis homestay - depart for Rajasthan - the land of havelis - forts and palaces via road. The first destination in this royal state is Mandawa (240 km / 05 hrs). Located in the north of Jaipur - Mandawa is a Shekhawati town known for its castles - havelis and cenotaphs. The stand alone feature of Shekhawati architecture here is the exquisite paintwork murals featuring the religious scenes - festooned war elephants - beautiful Rajasthani women and Rajputs - peacocks. Most of the paintwork belongs to the early nineteenth century. This town is also pictured for its havelis or merchant mansions. On arrival in Mandawa - check into the Mandawa Haveli - a heritage accommodation in the town. Built by a Marwari jeweler in 1890 - this haveli is a piece de resistance in terms of frescoes. This is the first frescoed mansion en-route to the old town. Later continue observing the colourfully illustrated walls of the town narrating numerous stories of the bygone era. 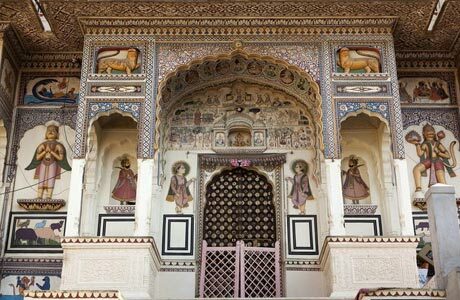 The artistic walls of Mandawa have earned this Shekhawati town an epithet of "open art gallery". Visit Hanuman Prasad Goenka Haveli - Goenka Double Haveli - Murmuria Haveli - Jhunjhunwala Haveli - Mohan Lal Saraf Haveli Gulab Rai Ladia Haveli - etc. After this artistic sightseeing of the town - return to Mandawa. Overnight at one of the havelies. After breakfast - leave Mandawa for Bikaner by road (190 km /3.5 hrs). This city echoes the emotion of the royalty and medieval grandeur fused into the citys old world charm. This is also one of the desert destinations in India. Dotted with scores of sand dunes - this warren city projects the havelis or merchant mansions in the most distinctive way. Upon arrival in Bikaner - check in the Harasar Haveli. 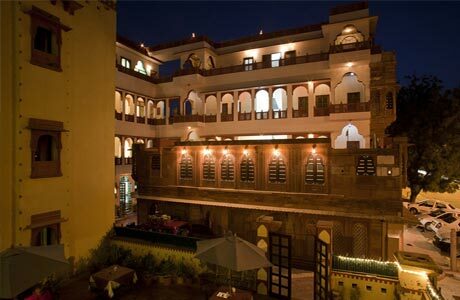 This is a haveli that has opened up its doors for tourists to feel the rich Rajasthani culture. Begin the citys sightseeing via visiting its iconic attraction - camels in one of the worlds largest Camel Research and Breeding farms here. Camels are an intrinsic part of life in Bikaner and are often seen with a great fascination here. Option of camel safari can be availed here. Later visit Junagarh fort - Lalgarh palace and Ganga golden jubilee museum as a part of Bikaner city tour. Optional visit to Deshnoks Karni Mata temple - famous for the presence of numerous rats. Return to Harasar Haveli for overnight. After breakfast - depart for - Jaisalmer via road. (330 km / 06 hrs). This is the second city in the desert circuit of Rajasthan. A part of Western Rajasthan - this city is characterized by the presence of Sonar Qila or Golden Fort rising from the golden hued desert. Upon arrival in Jaisalmer; check-in to the iconic haveli homestay of the city. (Golden Haveli / Nachana Haveli / Killa Bhawan). Overnight in Jaisalmer. After breakfast in the Haveli - begin a tour to the golden city of Jaisalmer - characterized with the presence of Jaisalmer Fort - Jain temples and Havelis. After this enriching day in Jaisalmer - spend the evening in Sam sand dunes for a short evening camel safari during the surreal sunset amidst the gold hued desert. This is considered one of the prime highlights of Rajasthan Havelis Homestay tour. Overnight in Jaisalmer. After breakfast in Jaisalmeri Haveli - depart for Jodhpur by surface (290 km / 05 hrs). 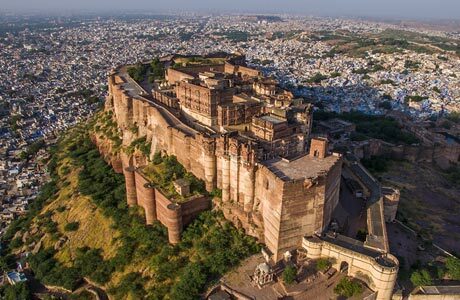 Jodhpur - the city washed in blue is the third prominent desert destination in Rajasthan. Standing on the edge of the Thar Desert - this city is characterized as the epitome of ancient Marwar kingdom. 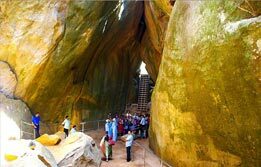 It is also the second largest in Rajasthan. Upon arrival in Jodhpur - check into the local havelis. (Desert Haveli Resort and Camp / Haveli Inn Pal / Jee Ri Haveli / Krishna Prakash Heritage Haveli / Pal Haveli). Overnight in Jodhpur. 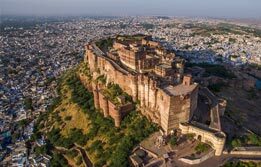 After breakfast at the homestay - continue the Jodhpur city tour via a visit to Mehrangarh Fort - the hill top perched fort overlooking the city. Discover the city in detail via Jaswant Thada and a local Rajasthani Sardar Market. In the noon - depart for Udaipur by road (275 km /05 hrs) - the next stop of Rajasthan Haveli Homestay Tour. 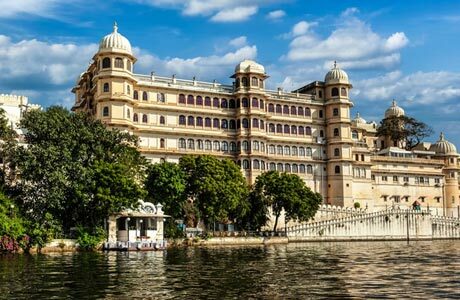 Udaipur is the romantic luxury capital of Rajasthan characterized by the presence lakes and dream-like forts. On your arrival in Udaipur - check-into the Haveli Homestay. (Amet Haveli / Jaiwana Haveli / Karohi Haveli / Mewar Haveli / Pahuna Haveli) Overnight in Udaipur. After breakfast, drive to Kota famous as the art haven of Rajasthan (180 km / 03 hrs ). Enroute visit Taragarh Fort, Painted Palaces and Lake. The Palace at Bundi is a fine example of the Rajput architecture, housing some of the superb Bundi murals. Upon arrival, transfer to the hotel. Rest of the day is free at leisure. Overnight in Kota. After breakfast - depart for Ajmer by road (290 km/05 hrs). On arrival in Ajmer - check-into the homestay. (Badnor House / White House Villa / The Villa / Kharwa Homestay). 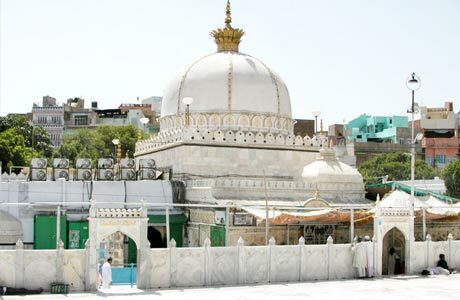 The main attraction of Ajmer is Dargah Ajmer Shariff - which can be visited this evening. Overnight in Ajmer. 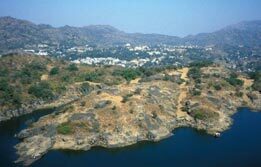 After breakfast at the homestay - begin the sightseeing of a nearby town - Pushkar (11 km ex-Ajmer). This is a sacred town set around the Pushkar Lake. A holy dip in the sacred Pushkar Lake is believed to wash away the sins of a life. The towns other attractions include the visit to only Brahma temple in the world. Later - depart for Jaipur by road (130 km/ .5 hrs). Jaipur or the pink city is the capital royale and the last stop over of Rajasthan haveli homestay tour. Upon arrival in Jaipur - check-into the haveli homestay of Jaipur. Overnight in Jaipur. After breakfast at the homestay - continue the full day sightseeing of Jaipur via a visit to Amber Fort. This is one of the most scenic attractions of Jaipur. Rising atop the hill - this sandstone fort is a must visit site in Jaipur. A ride atop royal elephants here is another great reason why tourists prefer to begin the city tour with a visit to Amber. Continue the citys tour via Hawa Mahal - The Palace of Winds and The City Palace - the living palace where royal family of Jaipur resides. A small part of City Palace is converted into a museum where armoury - swords and royal cloaks and other exciting royal belongings are displayed. Overnight in Jaipur. After breakfast - depart for Agra by road (250 km /0.5 hrs). Enroute visit Fatehpur Sikri - the ghost town of Mughal era. Upon arrival in Agra - check-in to the hotel. Overnight in Agra. After breakfast - begin the Agra city tour via visiting the Taj Mahal and the Red Agra Fort. 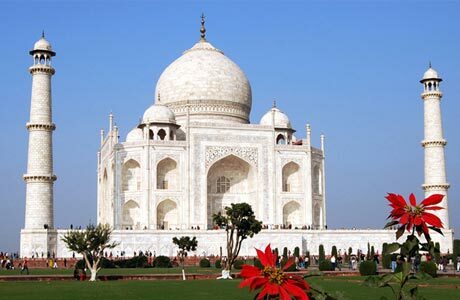 The visit to the Taj Mahal is an iconic experience of Agra and Rajasthan homestay tour. (Taj Mahal is closed on Fridays). Overnight in Agra. After breakfast - depart for Delhi International Airport by road (220 km/ 04 hrs) and board the flight for onward destination.